Regular servicing is the key to the long-term performance, efficiency and safety of your Mazda. Keeping the Zoom-Zoom factor at its peak is made easy, convenient and worry-free through the Mazda Maintenance Program. Our servicing plans give you the certainty of knowing exactly how much you will pay for a particular scheduled service at the time you book that service, no matter which Mazda dealer you use and no matter whether your new car warranty has expired. By checking the price of the service on our website at the time you book your service you can be assured that you will pay no more than that advertised price. We also understand everyone has different driving habits. That’s why we’ve revised our service scheduling to better suit you. Now you simply service your Mazda every 10,000kms. This correctly maintains your vehicle’s integrity and helps ensure trouble-free motoring. With Mazda Service Select you can vary your visit schedule according to how you use your Mazda. For example, if you travel on average 13,000kms per year, you can service your Mazda once every 9 months, if you travel less, say 8,000kms per year you only need to come in once a year. You’ll also get peace of mind as you will not pay more for a scheduled service performed by your Mazda Dealer than the price advertised for that service on mazda.com.au at the time your scheduled service is booked+. Just check mazda.com.au/service to view the current pricing when it's time to book your service. 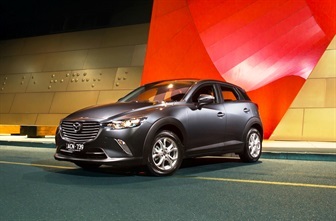 Zoom-Zoom is Mazda’s way of expressing the exhilaration, liberation and sheer joy that come from experiencing motion. We practice it every day. It’s why we build the kind of cars we do. It’s also why Mazda Service experts are better qualified than anyone to keep Zoom-Zoom alive and driving – today, tomorrow and down the road. The Mazda Maintenance Program, is the most effective way to ensure the passion and thrill born into every Mazda stays right where it belongs: at your fingertips. Looking after your Mazda is only half the story. We know that you are happiest when you are on the road with your Mazda, so keeping you there is our priority. At Mareeba Mazda we want your service experience to be as easy and convenient as possible. From the friendly reminder of your next visit, to the survey that follows, Mareeba Mazda takes the worry out of servicing your Mazda. Mareeba Mazda has comfortable facilities, factory trained staff, Genuine Mazda Parts on hand and a national network to call on. Together these factors will keep that Mazda Zoom-Zoom feeling and get you back on the road quickly. Fresh Zoom-Zoom. Exclusive to Mazda Service. Genuine Mazda Parts have Zoom-Zoom built into them. Every Genuine Mazda part has been manufactured to our original design and specification. In other words, they’re tried and tested so they fit your Mazda perfectly and are certified to meet the highest Mazda Engineering Requirements set by the factory in Japan. When we replace any part during the service program, you can feel totally confident your Mazda will perform exactly as it should. Almost all Genuine Mazda Parts come with a 'Whole of Life' Warranty, provided they’re fitted by an authorised Mazda Service Centre. You can’t get that peace of mind from anyone else. Why is Mazda Genuine Service important? Mazda are committed to making the most from every drop of fuel, this helps to reduce running costs and minimise the environmental impact of your Mazda. Regular service will ensure that your Mazda is running efficiently and you will reap the benefits for the life of your Mazda. Your decision to drive a Mazda is a ‘safe’ one, Mazda vehicles can be counted amongst the safest on the road. This is no accident; vehicle safety is a priority at Mazda. The Mazda Maintenance Program makes this a priority during service as well. Regular inspection of your Mazda’s safety systems gives you the peace of mind that they are there if needed. Servicing your Mazda as per the Mazda Maintenance Program at an authorised Mazda Service Centre gives you the peace of mind knowing that the maintenance or repair is performed as Mazda intended. Don’t risk your warranty. Make a Mazda dealer your only choice for your service and maintenance needs. Not only does a scheduled service give you peace of mind, Mazda Maintenance Program also helps protect your investment with written proof of the service history. When it comes time to sell your Mazda, one of the first things prospective buyers want to see is the service handbook. They want confirmation that you've looked after your Mazda. Regular servicing at a Mazda Service Centre demonstrates that you’ve maintained your Mazda, having it serviced by the most qualified technicians using top quality parts. Mazda employs the latest in automotive technology and systems to deliver a range of vehicles that achieve class leading levels of performance, drivability, efficiency and safety. To ensure these complex systems, and your Mazda, are running at optimum levels your Mazda dealer uses the Mazda Modular Diagnostic System (M-MDS). The M-MDS is the only system designed to electronically check all the vital functions of your Mazda under real driving conditions, for the most accurate analysis of its performance. Each time the M-MDS is connected to your Mazda, it checks the electronic systems, and provides the Mazda Service Technician with an electronic snapshot of your Mazda. Mazda Service Technicians trained with the M-MDS technology use this snapshot to ensure everything is calibrated to the latest factory specifications. We are constantly updating and downloading software from Japan into your vehicle to keep it performing at its peak. It's a unique advantage of Mazda Genuine Service.